The days are getting shorter and the air is getting brisk which means Halloween is approaching. The October 31st, time-honored tradition of dressing up and going door to door yelling “Trick or Treat” is still anticipated by young and old today. In Schofield residents will be making popcorn balls for visiting children. Liberty Village in Adams is anticipating 200-250 trick-or-treaters who will receive candy and treats handed out by residents. Children are invited to stop by any Copperleaf community on Halloween to visit residents and collect treats on the following dates of each communities designated time. Wausau area will have Trick-or-Treating on October 31st from 4:00 pm-7:00 pm. Stevens Point has downtown trick-or-treating on October 27, 2018 from 1:00 pm-4:00 pm and the Stevens Point community will celebrate from 5:00 pm-8:00 pm on October 31st. Sunday, October 28, 2018 from 3:00 pm-5:00 pm the town of Ripon will recognize trick-or-treating and the Adams Friendship High School parking lot will feature “Trunk-or-Treat” from 4:30 pm-6:00 pm on Friday, October 26th. 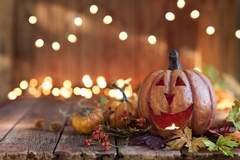 The residents at Copperleaf Senior Living shared some of their fondest memories from Halloweens past. One resident said, “I loved wearing fancy little dresses and wore a ton of make-up to make myself look beautiful.” Another recalled his mother taking the entire family to Wisconsin Dells and Portage for trick-or-treating and how he and his siblings would look forward to that all year long. Another recalled dressing up as a pirate to go trick-or-treating and using a pillow case to collect all the candy. Among other stories shared, a resident recalled having to dress up in old clothes and hats because money was tight, and they couldn’t afford new costumes. Some residents joked about soaping windows and performing tricks instead of dressing in costumes. Despite changes in pumpkin carving, decorations and costumes, the Halloween ritual, no matter what your age, is most often remembered as a happy childhood memory to be shared and passed down from generation to generation.